The original GS Series has been replaced by the GSX Series and GSM Series. Exlar continues to support the GS Series, and full documentation and specifications are available. 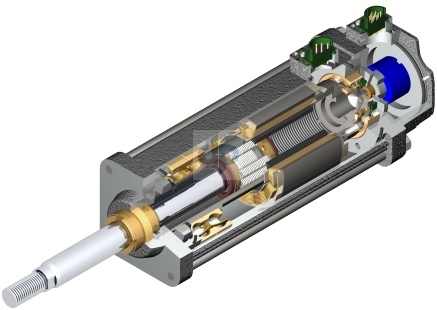 The GSM Series linear actuator is a cost effective solution offering the standard capacity inverted screw technology with travel life 5 times the life of comparable ball screw actuators. The GSM Series includes standard IP54 sealing, resulting in a longer lasting and more compact solution compared to ball screw actuators. The GSX Series linear actuator is suitable for just about any environment or application. This series features Exlar's high capacity inverted roller screw technology, providing travel life 15 times that of a comparable ball screw actuator. The GSX Series includes IP65 sealing, and these actuators come ported for air cooling or oil cooling. This fully integrated unit delivers higher continuous motor torque than conventional wound motors, and has a much longer working life than a ball screw system. Designed for Closed Loop Servo Systems, position feedback can be accomplished by resolver, encoder, or internal linear position sensor. Exlar motors with T-LAM Technology offers maximum motor performance with UL approval and CE compliance. The GSX's roller screw mechanism can handle heavier loads at higher speeds and is designed to withstand exposure to out side contaminants. GSX actuators can be lubricated with either grease or recirculated oil, specify when ordering. Special OEM lubricants are also available. GSX actuators are available in 5 frame styles (2"-7") and several mounting styles. Custom mounting styles can also be ordered. Optional features include; anti-rotate mechanism, pre-loaded follower, electric brake, and external end switches. AA = GS Actuator Size GGG = Feedback Type (also specify the amplifier/drive type model being used when ordering) - Standard incremental encoder - 2048 line with commutation, 5vdc. - Standard resolver - Size 15 resolver. Click here for motor data files. 50 = 5 inch frame actuator Allen-Bradley/Rockwell: Actuators used with Kinetix and/or Sercos based control systems require a 3rd party motion database purchased from AB/Rockwell. Please contact your AB/Rockwell representative for support. Optional 5 digit assigned part number for unique model number. 1. The dynamic load rating of zero backlash, preloaded screws is 63% of the dynamic load rating of standard non-preloaded screws. The calculated travel life of a preloaded screw will be 25% of the calculated travel life of the same size and lead of a non-preloaded screw for the same application. Preloaded follower is not available with absolute internal feedback. 2. Stator voltage and pole options allow for catalog rated performance at varying amplifier bus voltages and pole configuration requirements. 3. Linear feedback is not available in the GSX20 and not available in the GSX30 14" and 18". 4. The brake option may require a third cable, consult Exlar. 5. These housing options would typically be accompanied by the choice of the electroless nickel connectors if a connectorized unit were selected. This choice may also indicate the need for special material main rods or flanges. 6. Available as described in Feedback Types. 7. 0.1 lead not available above 12" stroke in GSX40 or 10" stroke in GSX50. 8. 0.75 lead not available above 12". 9. 1.0 lead not available above 10" stroke. 10. GSX60 uses M40 size 1.5 power connector.